Multitasking on the iPad has been improved. It’s so good that I started wondering if I need a Mac. It’s been a long while since Apple released a decent Mac Mini. (The 2014 model is only marginally better than the 2012 model – worse in some areas too.) I don’t feel like spending $2000 on a Mac laptop, especially when my iPad Air 2 is so fast. And yet, I haven’t really been able to do work with my iPad. iOS 11 doesn’t really change that, not for me, but it is a step closer. The “Files” app lets you easily see what’s in iCloud. It’s a great way to work across all three platforms – Mac, iPad and iPhone. I still miss having a real keyboard. While the new virtual keyboard for iOS 11 is improved, it doesn’t help me. I prefer to use the split-keyboard, which doesn’t include the new flicking option for letters, numbers, symbols and punctuation. The new tiles in the Control Center are neat. It’s a lot better to use than the previous setup. There’s even a new option for screen recording. That could be handy, especially for creating tech videos. Yet, there were some problems. The Apple TV remote in Control Center didn’t connect with my Apple TV. Also, for WiFi and Bluetooth buttons, off doesn’t really mean off. Disabling those features via Control Center is only temporary. While it can be permanently disabled from the settings, that’s a lot slower. Fortunately, I can tell Siri to “Turn off WiFi” and she does. Siri has a new voice. It sounds more lifelike. Although, it’s not in the voice (Susan Bennett) I’m use to. The “American Female” voice sounds like a Millennial. It makes me lose respect for Siri. I don’t want some young kid giving me driving directions. It sounds somehow less trustworthy. Before, Siri sounded like mom. Now she sounds like a little sister. I tried using different accents, British or Australian, but those still used the more robotic voices. That’s where the problems started to add up for iOS 11. One of the most noticeable is that a lot of apps stop working. 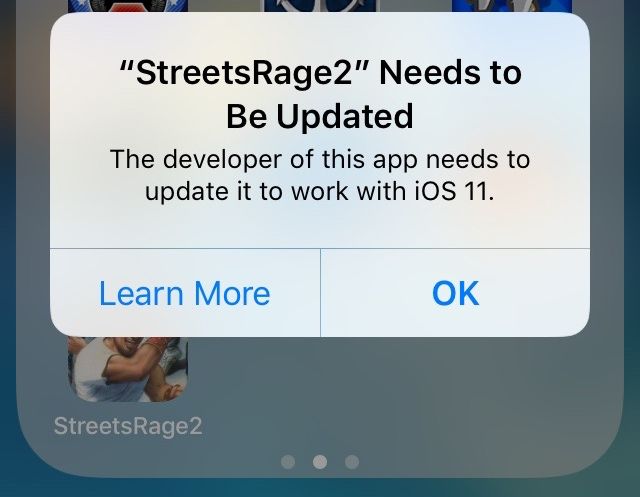 On iOS 11, I can’t play classic games like Streets of Rage 2. It’s the same game since the early 90’s. It doesn’t need an update, except that it doesn’t run in 64-BIT mode. It’s a game from the 16-BIT Sega Genesis, so clearly this is a problem. Sega has been re-releasing their classics as emulated versions, but there have been a lot of issues. As an example, Phantasy Star 2 has been plagued with save issues. Developers have to take on additional work to keep their apps running on iOS. A lot of developers might feel it’s not worth it and give up on their older apps. Since I’ve been using iOS for about seven years, I have collected quite a few of these incompatible apps. Getting new apps is especially tedious now too. I hate the new App Store. Apple wants people to visit the App Store every day, so it has an “Apple News” app layout. The “Today” section is awful. With millions of apps to search through, big stupid pictures don’t help me. I used to visit the App Store at least once a week. That was to check out the “Free App of the Week”. But unfortunately, Thursday passed without a new free app. Augmented Reality Apps are being hyped, but that’s not exciting me – especially since ARKit is not supported on my iPad Air 2. I was surprised to see that such a powerful iPad was excluded from the fun. My iPhone SE does support the new AR Apps. But unfortunately, I’m kinda burned out on apps in general. I have four $25 iTunes gift cards ready for action, along with some credit on my iTunes account, and yet I’m underwhelmed with what’s available. Apps on iOS are stale. It’s just not as fun as the first time I played games like Angry Birds or Tiny Wings. Augmented reality is not new. Word Lens was doing that on iOS back in 2010. At this point, it doesn’t really matter if I like iOS 11. There’s no going back. But even if I could, I don’t want to. Overall, I think iOS 11 is a good update. For a point-zero release, I haven’t had much trouble with it. The new App Store, loss of non 64-BIT apps and the new Siri voice were the biggest disappointments for me. Yet, the improved multitasking on iPad, the new Maps app and better Control Center balance it out.